Last week, the World Bank released its latest Ethiopia Economic Update entitled, The inescapable manufacturing services nexus: Exploring the potential of distribution services. This report provides an overview of recent economic developments in Ethiopia, assesses the sustainability of the country’s growth model, and highlights opportunities for distribution services—defined primarily as “commission agents’ services, wholesale trade services, retailing services, and franchising” for the purposes of the report—to promote structural transformation and accelerate growth in Ethiopia. In terms of Ethiopia’s recent economic growth trends, the report notes that gross domestic product (GDP) growth increased to 10.9 percent in fiscal year 2017, following a year of more subdued growth (8 percent in FY2016)—due to drought and a decline in agricultural production. Still, the country’s average annual growth rate was 10.3 percent over the period 2005/2006-2015/2016—much higher than the regional average of 5.4 percent. Looking ahead, Ethiopia’s growth projections in the medium term are expected to average around 8 percent annually under the country’s current investment-focused and export-led growth model. 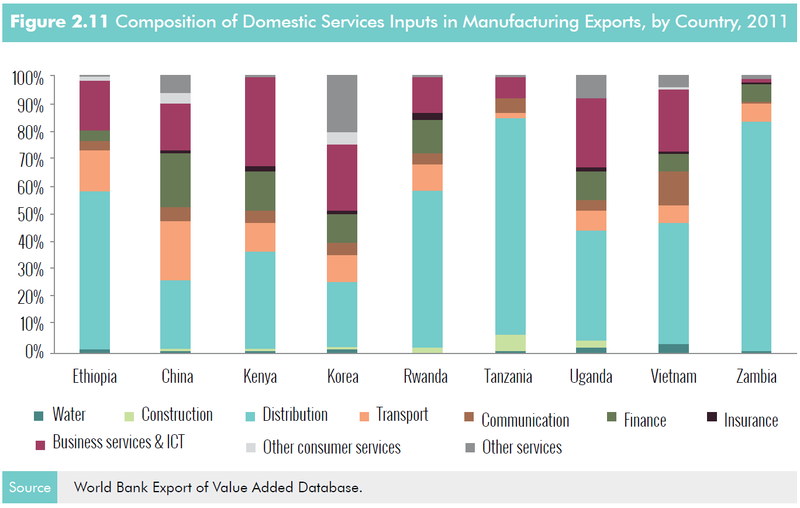 To advance the government’s export development agenda and accelerate growth, however, the report argues that the government should support policies to strengthen the linkages between goods and services markets since they are both part of “an interconnected chain of value addition from production to final consumption.” In particular, distribution services could play a transformative role in increasing export competitiveness and enhancing both the services and manufacturing sectors in Ethiopia if certain challenges to the sub-sector, identified below, are addressed. Currently, distribution services contribute nearly 15 percent of Ethiopia’s GDP, and the sub-sector employed over 42 percent of the country’s active population (including informal, unskilled, female, and part-time workers) in 2013. The formal distribution sector is considered the second-leading sector in terms of formal employment in Ethiopia. Distributors have played a crucial role in linking producers and suppliers, especially in recent years as supermarket chains have emerged throughout the country. In addition, distribution services can contribute to the expansion of access to affordable products for the poorest households by reducing supply chain costs and reaching new markets. By upgrading traditional distribution systems to improve safety standards, reduce spoilage, and increase traceability of products, distributors can improve the structure and efficiency of markets, in addition to enhancing upstream (with producers) and downstream (with retailers and processors) linkages. In terms of its linkages to the manufacturing sector, the distribution services sub-sector (including wholesale and retail activities) was the most important source of domestic services inputs in Ethiopia’s manufacturing production and manufacturing exports in 2011 (see Figures 2.10 and 2.11). This was also the case for select comparator countries in Africa and Asia, including China, Kenya, Rwanda, Tanzania, Uganda, Vietnam, and Zambia. However, trade barriers, high regulations, and the prohibition of foreign services suppliers and investment in the sub-sector restrict ongoing distribution operations and limit the entry of new distributors. The report argues that relaxing trade barriers, addressing regulatory challenges, and contending with issues related to informality will be crucial to making the sub-sector transformational. For example, it recommends that the government implement the necessary regulatory frameworks to improve the business environment, dispense with onerous entry requirements (including protracted registration processes, multiple licenses, or inadequate zoning regulations,) and remove price controls, which reduce competitiveness and can hurt poor consumers. Furthermore, addressing skills and infrastructure constraints by investing in local training programs in addition to roads and ports is necessary to create the human and physical capital needed for a successful distribution services sub-sector.